Personalized marketing has been getting some buzz in the past few years, and the reason why is it can lead marketers and their organization to a much higher ROI. Don’t believe the hype? Research from MarketingSherpa indicates the #1 reason why most leads never convert to sales is lack of lead nurturing throughout the decision making process. So if you’re not focused on personalizing your marketing, that is definitely an incentive to start doing so. 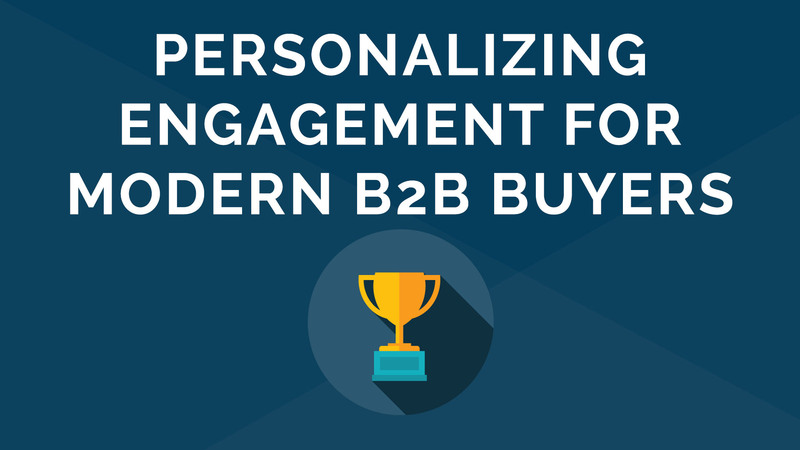 But why does personalized marketing lead to such great results? The reason is it makes your leads and customers feel just a bit more special. By providing them with content and resources that match their needs, you are showing them you have their best interest in mind and are ready to help solve whatever issue is keeping them from seeing the results they want. Now, while personalization can be as simple as adding your lead or customer’s name to an email, there are plenty of other ways for you to make your marketing more personal. Whether you’re new to personalized marketing or have already taken a stab at it, here are a few ways you can create a more unique and tailored experience. Sure, there are a variety of ways for you to gather information. As a marketer, it’s important to look at statistics such as website traffic, email click thrus, etc. But an easier way to get to know your leads better is by reaching out and asking them who they are and what they’re looking for. A great way to get to know your customers better, and start creating a more personalized experience, is by asking them to fill out a form. Whether you place them on your website or in an email, forms are an easy and effective way to gather new insights on your leads and current customers. If you need to give them an incentive to fill it out, try gating relevant content or offering some other exclusive offer to entice them. This may not seem like personalized marketing at first glance. However, the act of reaching out demonstrates to customers that you are making an effort to get to know them better and provide them with information and solutions that best suit their needs. And, if your customers respond, it can be a much more efficient way of collecting information and getting them to the next stage of the sales funnel. That’s not all, this opens the door to start collecting more information and continue building a conversation. That way, when you’re ready to pass off your leads to sales, they’ll be equipped with insights that will enable them to recreate that same level of personalization your customers have grown accustomed to. Nurture campaigns allow you to create a more personal experience for customers because you can target them based on interest, industry, and a variety of other characteristics. If you’ve never run a nurture campaign before, segmenting your leads is a good place to start. Segmenting your lists can help you provide more personalized and timely communication to your leads and current customers. That’s because instead of sending out a generic campaign to all your contacts, you can provide specific groups with content relevant to them. Aside from that, what is the incentive of creating a more personal experience through lead nurturing? Well, to start, it can result in a greater ROI. In fact, stats show that leads that go through a nurture campaign make purchases that are 47% larger than leads who don’t. You can take up your personalization efforts up a notch by quickly responding to the questions and pain points of your customers through triggering. What this mean is that your customer or lead will receive an email based on a specific event. This could be anything from a specific webpage visit, to a change in their profile or behavior. This allows you to strike while the iron is hot! Whether it’s a trade show, a social event, or webinar, getting some face time with customers is an excellent way to develop a more personalized experience. And the proof that person-to-person marketing works is there, with 67% of marketers regarding events as their most effective content tool. One of the reasons in-person marketing works is that having face to face contact with your customers allows them to see who you are beyond a logo. Having the opportunity to meet members of your staff reminds them that there is a team of people looking out for their best interest. But, what makes events truly unique is that they enable you to interact with your customer in a very different way. Talking to your leads or customers in person, provides an opportunity for you to address any of their questions and pain points almost immediately. It also gives you a more in-depth insight into what your customers are thinking, which you can use to shape your strategy with them moving forward. For us marketers working in the B2B realm, one of the challenges when it comes to creating a more personal marketing experience is dealing with a multitude of accounts. And, although you may have an extensive content and resource library to cater to all your different customers, it may be overwhelming for them to navigate all that information. You can make this experience much more personal and less hectic by curating a selection of resources that are relevant to your customer. You can do this on your website by having tags which your leads and customers can click to sort through information. These could be related to their industry, overall business goal, or features they are looking for. Or you can make this search for content even more effortless by gathering a list of resources and sending them directly to their inboxes. Search through your archives and compile useful blog posts, pages and other content that your audience may have missed. Doing this will allow you to recycle content, taking out some of the work, and drive more traffic to your website or blog. At the end of the day, your leads and customers want to know that your platform or service is worth investing in. You can reassure them that it is by giving a sneak peek of what you can do for them by providing estimates and examples of the kind of results they can expect to see. Don’t know how to execute this effort? A landing page is the perfect way to show your prospective customers and leads what they can hope to gain by doing business with you. For example, Absolute Exhibits, a company focused on creating trade show exhibits, uses landing pages to display the portfolios of their sales rep. This enables their prospects and leads to get a more clear idea of how they’ll benefit from this partnership.